The last few days of balmy spring weather brought DC’s cherry blossoms bursting forth in all their frothy pink splendor to highlight the annual Cherry Blossom Festival. 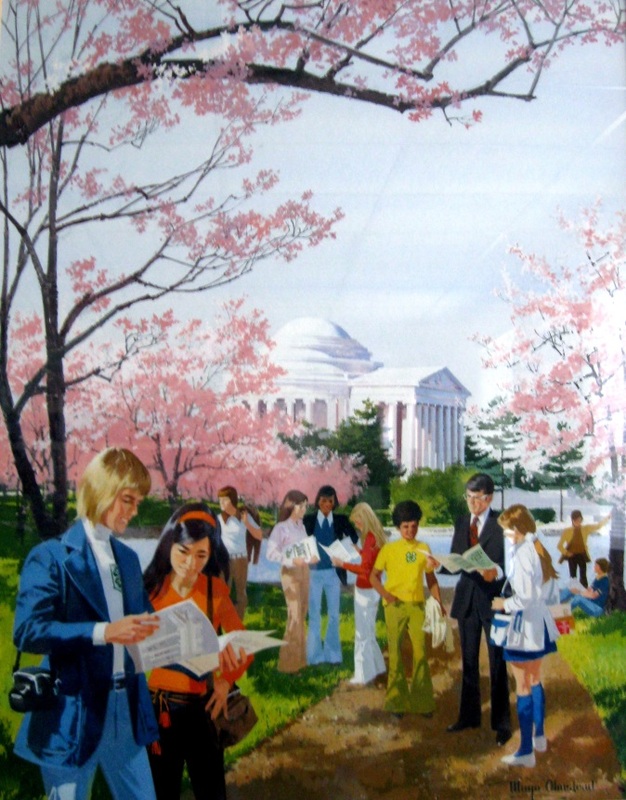 This painting captured that spring ritual in the c. 1975 National 4-H calendar art. So, for this issue, what is more fitting than 4-H helping Mrs. Obama plant a cherry tree? Or a “Hands on History” challenge to create healthy cherry-based snacks? There’s a new self-guided history tour at the National 4-H Youth Conference Center. Using QR Codes, we’ve put up six sites in and around the J. C. Penney lobby for visitors to scan and learn a bit about that piece of 4-H history. The tour covers a broad span of time from a portrait of the “Mother of 4-H” to artifacts from the most recent 10 years of the program. Scan the QR Code in this issue and see where it leads. We continue the “Voices of 4-H History” program of recording audio and visual memories as we come closer to the Centennial date of signing the Smith-Lever Act (May 8) which gave federal funding to the Cooperative Extension Service. Progress updates from several states, some suggestions, and a list of available resources make up this month’s coverage. “Voices” participants are scripting, filming, editing, re-filming, and re-editing their potential entries in the national 4-H film festival, “2014 FilmFest 4-H.” This year’s festival will be in St. Louis and “Voices of 4-H History” is an official category in the August competition. And now it’s time for that healthy snack: a juicy slab of freshly-baked cherry pie while you enjoy this issue! This entry was posted in 4-H History Preservation Newsletter, History and tagged 4-H History, Newsletter, QR Codes, Self-Guided Tour by Sue Benedetti. Bookmark the permalink.